In a recent paper published in International Environmental Agreements, my co-authors and I argue that such a state of affairs – neither open conflict nor full cooperation – characterizes many important shared basins around the world and is often overlooked by those looking to categorize a relationship as either conflictual or not. The question analysts must answer is not whether there will be water wars, but how water conflicts can be so static and quiet, and yet so damaging. How have countries like Egypt, Turkey, and Israel held control over shared water for so long? As part of a series considering interstate power over water resources, our paper and others build on a 2006 piece introducing the concept of “hydro-hegemony,” the extensive control that some actors hold over water through a variety of forms of power. Stasis is a condition that frequently marks international water conflicts (at least of the non-violent variety). A stagnant situation can be seen in the Tigris and Euphrates River Basin shared by Iraq, Syria, and Turkey. Upstream Turkey’s massive dam-building program, the Great Anatolia Project, which will grant Turkey full control over the flow of both rivers, has been essentially unchallenged during the last decade and is now almost complete. We find that stagnant water conflicts are explained in part by the fact that actors in transboundary water interactions engage in coexisting conflict and cooperation. Governments will collaborate on some aspects of governance while clashing over others, just as India and Pakistan stabilized water supply even in the midst of interstate tensions through the Indus Waters Treaty. Treaties sometimes end surface conflict but fail to solve the underlying problem, allowing hostility to build up over time. When Nepal and India negotiated the Tanakpur Barrage, for example, military conflict was avoided. But India increased its grip on power and this “cooperation” has not led to ideal outcomes for the environment or for people. Just as conflict and cooperation can coexist, contest and compliance are closely intertwined and frequently happen simultaneously. The government of Lebanon and the Palestinian Authority often speak out against Israel’s hydro-hegemony in the Jordan River Basin. Yet they also regularly comply with the arrangement. Since the Oslo Accord in 1993, Palestine has officially negotiated with Israel over water, and through the Israeli-Palestinian Joint Water Committee, Palestine formally consented to water projects in Israeli West Bank settlements. A complex and coexisting array of mechanisms, unequal power distributions, and geopolitical relations have led to this static arrangement. Can We Break the Deadlock? In our article we argue that closer attention should be paid to states’ intervention strategies in seeking to influence or challenge water arrangements. States that see their water reality as unequal or problematic might contest the existing hydro-hegemony and use a variety of actions to try to change their position. Examples include the destruction – or construction – of a dam, the launch of a major diplomatic initiative, or the reframing of water as a human rights issue, rather than an economic or resource question. Determining which strategies are most successful may prove important in breaking up water hegemonies. The Nile is the rare example of a case where hydro-hegemony is being successfully challenged. Egypt, the downstream riparian, has held control over the bulk of the river’s flows for millennia. The country’s long-standing control has been supported in the modern era by a 1929 colonial treaty granting Egypt rights to the river’s flows and a veto over upstream projects. The 2010 signing of a Cooperative Framework Agreement by upstream neighbors Ethiopia, Kenya, Uganda, Rwanda, and Tanzania, however, signaled a clear contestation of the status quo. Then in 2011, while Egypt was embroiled in political turmoil following the Arab Spring, Ethiopia started the construction of the hotly contested Grand Ethiopian Renaissance Dam. When finished in 2017, the dam will give Ethiopia significant control over downstream flow. It may also re-shape regional politics, potentially sparking a renegotiation of long-stagnant water-sharing arrangements. Egypt has reluctantly entered trilateral negotiations about the dam’s operations with Ethiopia and Sudan, and Burundi has since signed the Cooperative Framework Agreement, with the Democratic Republic of Congo expected to as well. While it is perhaps too early to draw conclusions, it is clear that power is shifting. The non-hegemonic states’ persistence in working against the status quo was a necessary, if not fully sufficient, condition of that shift. What can we learn from the Nile? For countries like Iraq, Syria, and the Palestinian Territories, waiting for the regional hegemon to change is not wise. Instead, it is important to understand these arrangements as static water conflicts that are not likely to be resolved without intentional efforts to break them. Diplomats and analysts must better understand how equitable water arrangements actually come about and learn more about the effectiveness of various intervention strategies. Beginning to see beyond war and peace is an important start. Filippo Menga is a Marie Sklodowska-Curie research fellow at the University of Manchester. Contributors to this piece from the London Water Research Group include: Rebecca L. Farnum, EPA Marshall scholar at King’s College London; Jeroen Warner, associate professor of disaster Studies at Wageningen University; Mark Zeitoun, professor of water security and policy at the University of East Anglia; Nathanial Matthews, research coordinator at the CGIAR Program on Water, Land, and Ecosystems; Ana Elisa Cascão, program manager at the Stockholm International Water Institute; and Naho Mirumachi, lecturer and King’s water lead at King’s College London. The London Water Research Group is a diverse group of academics and practitioners, and the views expressed in this article are not necessarily those of individual members or the group. Sources: Haaretz, International Environmental Agreements: Politics, Law, and Economics, The Geographical Journal, Middle East Policy, Mirumachi (2015), Water International, Water Policy. 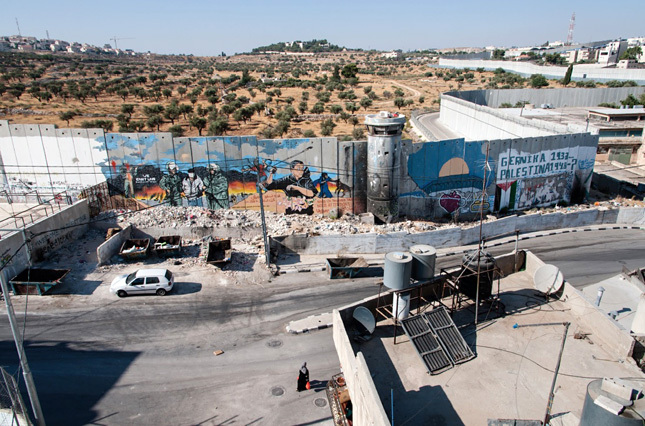 Photo Credit: A wall divides the Aida Refugee Camp from Bethlehem along the West Bank border, courtesy of the Palestine Israel Ecumenical Forum.